Tarleton is a strong advocate for workforce development and the maritime industry concentrated in her district. 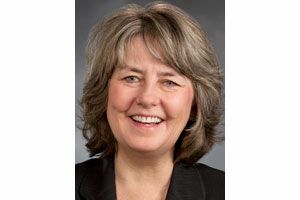 Gael Tarleton is particularly well suited to the 36th Legislative District, where the Ballard Democrat has served in the state House since 2012. Voters in the district should elect Tarleton to a fourth term in House Position 2. A former Port of Seattle commissioner and Pentagon intelligence analyst specializing in port security, Tarleton is a strong, pragmatic advocate for the maritime industry concentrated in her district. She’s also shown leadership on expanding higher-education and vocational programs, areas that will be receiving more attention in the Legislature now that K-12 reforms are being implemented. Strengths: A former Port of Seattle commissioner and Pentagon intelligence analyst specializing in port security, Tarleton is a strong, pragmatic advocate for the maritime industry concentrated in her district. Challenger Matt Dubin, a Magnolia personal-injury lawyer, is a standout among the group of politically inexperienced Libertarians bravely challenging incumbents this year. Dubin has a good grasp of issues facing his district and the state, including tax fatigue and the need for government to be accountable and willing to admit mistakes and change course when policies are failing. Dubin’s frustrations with the entrenched, two-party political system resonate. But to be effective in Olympia, ideals must be balanced with the reality of how the Legislature operates. Perhaps Dubin should start by bringing his enthusiasm for better, less partisan government to the Seattle School District or Seattle City Council. Tarleton supports gun-control Initiative 1639 but Dubin does not. Tarleton supports the carbon tax approach of Initiative 1631. Dubin favors limiting carbon but not I-1631, arguing that the state would fare better if it offered tax credits to companies that reduce emissions. Tarleton is rightly apologetic about voting for Senate Bill 6617, the noxious effort by the Legislature to partly exempt itself from the state Public Records Act. She pledges to support an accountable public-records system for lawmakers. Dubin’s sharp challenge of Tarleton and the two-party system is welcome. But the 36th District and the state will be best served if voters elect Tarleton to another term. Information in this article, originally published Sept. 9, 2018, was corrected Sept. 12, 2018. A previous version of this story incorrectly stated that Matt Dubin supported gun-control Initiative 1639. He does not.